The sperm is collected through masturbation into a sterile pot, either at the hospital in a specially designated room, or at home providing that the sample is brought from home to the hospital within the hour and that the sample is kept at body temperature. Sperm preparation consists of separating the spermatozoa from the seminal fluid and selecting the most motile spermatozoa with a normal morphology. This seminal fluid can be toxic for the spermatozoa in the long term and cause infectious or allergic reactions if it is directly introduced into the uterine cavity, hence the need to eliminate it. 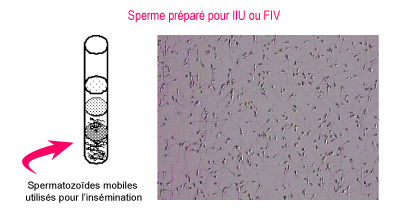 A spermogram is carried out before and after preparation. The sperm preparation technique we use in the laboratory is called density gradient. In some cases, if there is no sperm in the ejaculate, it is possible to surgically retrieve fragments directly from the testicles or epididymis.